BMW stand as one of the leading builders of convertible cars. In the 1980s they helped to revive the cabriolet with the E30 3 Series which proved to be wildly popular. The secret of the BMW convertible was to make the car both practical and desirable. They managed it with great effect and their soft-top car sales only continue to grow. Today BMW convertibles are the market leaders in many sectors thanks to great build quality and impressive driving dynamics. The range includes both fabric and hard top convertibles with 4 seats as well as the sporty Z4 Roadster. The new BMW Z4 Roadster has now been revealed with sales beginning in the Spring of 2019. While the previous generation aimed to broaden appeal with luxuries and a more compliant driving experience, the new car should be lighter and more agile. Not completely unexpected but a very pleasant surprise is the new BMW i8 Roadster. 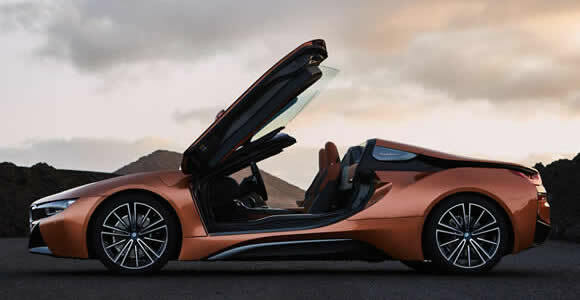 The futuristic hybrid i8 Roadster comes alongside a facelifted version of the coupe. The next generation smaller BMW Convertible has been unveiled. The BMW 2-Series Convertible is the successor to the 1-Series droptop but joins the German brand’s slightly confusing new naming strategy.